A cataract is simply a "clouding" of the natural lens in your eye. It is a natural process with ageing. As light passes through the cloudy lens, it is diffused or scattered. This results in blurred or defocused vision. A cataract generally should be removed to provide better, clearer vision. When your doctor tells you that you have a cataract it may be a frightening thought to consider. 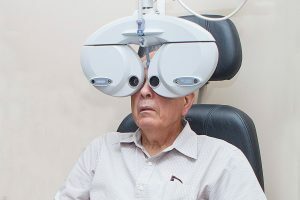 But, once you understand what a cataract is, how it will be removed, and the life-changing benefits cataract surgery can bring, you'll likely wish you'd had the procedure sooner. A cataract can progress until eventually there is a complete loss of vision in your eye, and neither diet nor laser treatment will make a cataract go away. LASIK eye surgery can not treat a cataract. However, there is a cataract surgery that can help restore your vision, long before you experience loss of vision significant enough to interfere with your daily activities. Cataract surgery is one of the safest, most effective types of surgery. It's also one of the most successful. After you and your eye doctor have decided that you will have cataract surgery, your doctor will measure your eye to determine the proper power of the new clear lens (called an IOL) that will be placed in your eye during surgery. What Lens to Choose for Cataract Eye Surgery? An artificial lens, called an IOL, will be implanted in the eye to replace the eye's clouded crystalline lens during cataract surgery. Your doctor will work with you to decide which IOL is best for your visual needs. There are three types of IOLs, each designed for a specific corrective function. Multifocal lenses are designed to correct a range of vision - near through distance. Accommodative lenses are designed to move within the eye to allow some range of focus from near to far. Cataract surgery is an outpatient procedure that will only take a few hours. When you arrive, your eyes may be treated with eye drops and anaesthetic to minimize any discomfort during the operation. During this routine operation, a small incision is made in the eye. Your surgeon will use a tiny instrument (about the size of a pen tip) to remove your clouded lens. Once this is accomplished, your surgeon will insert an artificial intraocular lens (IOL) into your eye. For more information regarding Cataract Surgery and other vision correction treatments, please contact our counsellors and they can help set up an appointment to meet and evaluate what would be best for your situation.